Aeon is hygienic; fabric free conveyor belting that eliminates tracking and slippage problems. Aeon replaces modular belting, it is easy to install, clean and does not have bacteria harbouring crevices, making it ideal for use in the food processing industry. 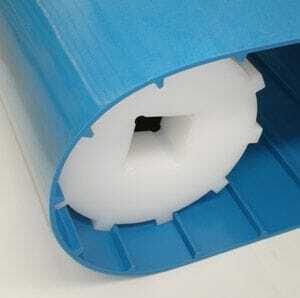 Aeon-50 is manufactured 3 - 5 mm thick in Polyester (PE) or Polyurethane (PU) and Aeon-25 in 2-2.5 mm thick. Aeon is characterised by its high cut and abrasion resistance and non-absorbent aspects. *USDA approved and meets FDA requirements for contact with dry, bulk, fatty and wet foods. Available in smooth top surface or diamond embossed for easy release and low friction surface.